The following article is about the author's research and experience with the 2014 Jeep Wrangler Sport 4x4 Willys Wheeler Edition. If you're looking to purchase check out our inventory of Wrangler (2-door) and Wrangler Unlimiteds (4-door) and call our World Class Internet Department at (800) 680-0835. 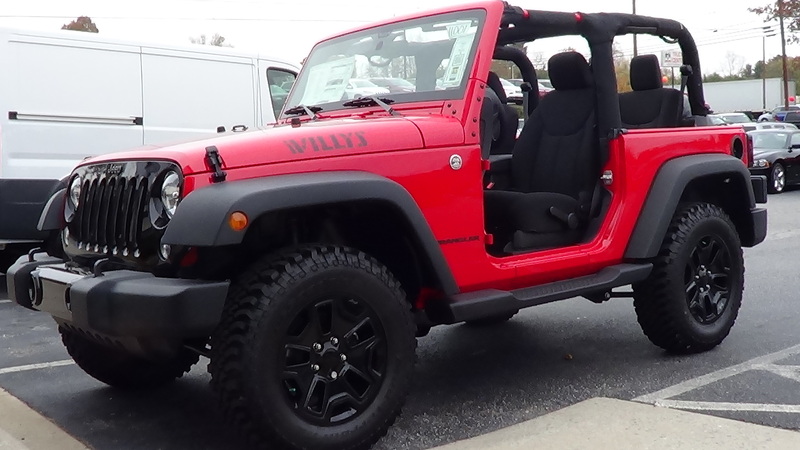 This is the highly capable 2014 Jeep Wrangler Willys Wheeler edition. Recently I was at our Hendersonville Chrysler Dodge Jeep Ram location to help fix a few computer problems, help our IT Manager with a project and get some updated staff photos for the website. While I was there I was asked if I had the chance to check out the 2014 Jeep Wrangler Sport 4×4 Willys Wheeler Edition they had on their showroom floor yet. When I told them I hadn’t, they asked me if I’d like to check it out, get a video and tell you guys about it. Short answer: Absolutely! So, I did some homework to find out what it is that makes the 2014 Jeep Wrangler Sport 4×4 Willys Wheeler Edition so remarkable. We’ll dig in to that below. What makes the 2014 Jeep Wrangler Sport 4×4 Willys Wheeler Edition so remarkable? If my previous posts have taught me anything it’s the you guys are busy and want the information to be easy to find. So I’m just going to bullet-point some of the key features and equipment below. First and foremost, it’s a Jeep Wrangler Sport. That’s the entry-level, best value Wrangler. This means you get all sorts of great standard equipment. 3.6L V6 “Pentastar” engine. 285 horsepower and 260 lb-ft of torque. It still stands that the 2014 Jeep Cherokee Trailhawk is my favorite vehicle of 2014. That said, I don’t think it’s really fair to the 2014 Jeep Wrangler Sport 4×4 Willys Wheeler Edition to be graded on the same scale. For one thing, the Cherokee has all sorts of great comfort features and options. You’ll find it’s loaded to the brim with all sorts of high tech safety, comfort and convenience features. It’s also meant to be a comfortable and reliable daily driver. It does has probably the most sophisticated and capable 4 wheel drive system in it’s class which is certainly a plus. The Willys Wheeler however is not about comfort or technology. Those of you who are interested in the Wheeler are interested in one of two things usually. First, it’s rugged and unique styling. Second, it’s incredible and affordable off-roading capabilities. While it’s definitely true that the Cherokee Trailhawk is exceptionally capable off-road, that’s far from it’s only purpose. The Wheeler is made to be a tough, fully-capable, ready for anything off-roading king. Well, that’s about enough “tell”. How about some “show” so you can decide for yourself? Here’s a shot of the 2014 Jeep Wrangler Willys Wheeler I took for a short spin without the doors or top. You’ll definitely want one after you experience it first hand! What do you think? Ready to check it out firsthand? Give our World Class Internet Department a call right now at (800) 680-0835 to set an appointment or for additional questions. If you’re more of the email and text type you can also fill out this form to communicate non-verbally.